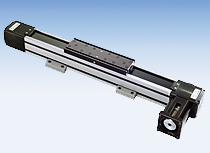 The Lintech 550 series linear slides are designed to handle large loads at very high speeds. These linear actuators use a low friction, preloaded, recirculating linear ball bearing system, which ride on a single precision ground linear square rail. The single linear profile rail is mounted to a precision machined aluminum base, which offers a rigid support over the entire travel of the table's carriage. The load is mounted to a precision machined aluminum carriage, which has slots machined into it. These slots, along with the base mounting brackets, are used for the mounting of the user load. The drive system uses two pulleys, along with a high strength, steel reinforced polyurethane belt, which provides 8.071 inches (205 mm) of linear movement per revolution of the input shaft. The simple belt tensioning system allows for easy adjustment of belt tension by the user. 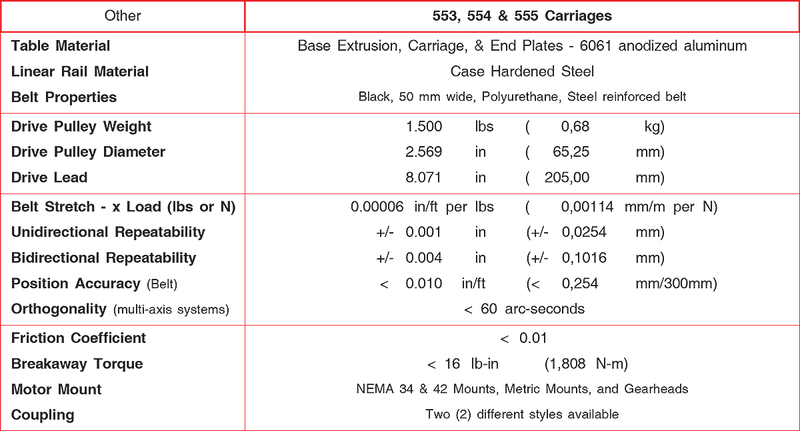 The belt also acts as a cover, preventing debris from getting into the linear bearings & rail.